Let this image haunt your nightmares. It’s been a while since I sat down and watched something older. 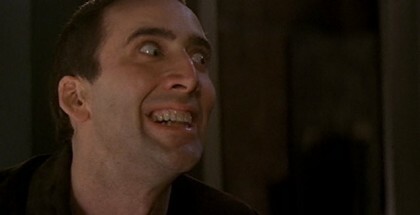 I decided to spend last night watching John Woo direct one of Nicolas Cage’s classics, Face/Off. Face/Off begins with FBI agent Sean Archer (John Travolta) capturing the infamous terrorist Castor Troy (Cage). Troy winds up in a coma, but Archer needs to find the location of a bomb Troy. So he decides to undergo a face transplant surgery where he takes on Troy’s face so he can go undercover and extract the information out of Troy’s brother. Things get complicated when Castor Troy wakes up from his coma and then takes Sean Archer’s face. Yes, Sean Archer decides to go undercover into a maximum security prison while wearing a terrorist’s face with nobody besides three people knowing who he really is. It’s a plan so stupid that even the characters in the movie question it. On top of that, the surgeon just carelessly left Sean Archer’s face just lying around, making it very convenient for the faceless Castor Troy to pick it up and put it on. If the entire team that sent Archer in on this operation wasn’t killed, I’m sure they would’ve been fired. This movie will test your absolute limits in how far you can suspend your disbelief. When Nicolas Cage switched to being Sean Archer, he was showing a lot more restraint for the most part, uncharacteristically so for Nicolas Cage’s usual scenery chewing. At the same time, (post-Pulp Fiction, pre-Battlefield Earth) John Travolta got to experience some of the fun Nicolas Cage had when he became Castor Troy. The actors clearly had a lot of fun with theirs and each others’ roles. Face/Off had many of the John Woo setpieces you would recognize if you have seen movies like 1992’s Hard Boiled. Early on in the movie, we see Castor Troy diving in the air firing akimbo pistols. While Face/Off is by no means a cinematic classic, John Woo definitely had his moments of brilliance in the movie. A particularly well-done scene was Castor Troy (as Sean Archer) leading an FBI raid on his own hideout because he finds out the real Archer (as Castor Troy) is hiding out in it. It’s an epic shootout with a lot of bullets and bodies flying in the air, but the movie’s peak was when we see Troy and Archer face each other off (no pun intended) one-on-one. Face/Off is yet another action movie I have seen where I think it would’ve benefited if some of the fat was trimmed off the story. The movie was just a little bit too long, especially since it bogged down just a little in the middle. Nonetheless, it wasn’t anything I expected. I was actually expecting a movie that’s so bad it’s good, as Nicolas Cage movies tend to be. Instead, I think I found what was probably the best movie John Woo made after relocating to the States. If you want a stupid action movie, you can definitely do a lot worse than Face/Off.